The Banyan Tree Lang Co resort, part of the Banyan Tree Hotel Group, is the first world-class integrated resort in Vietnam. Located in central Thua Thien Hue province, the Banyan Tree Lang Co resort is just an hour’s drive north from Da Nang International Airport and boasts views of the Truong Son Mountain Range, with diverse geography and spectacular national parks. As guests approach the resort, the excitement of the largest city in central Vietnam, Da Nang, gives way to scenes of unspoiled nature, with trickling streams against a backdrop of the staggering mountain range. The resort also enjoys views over the longest private beach in the Lang Co area. Guests will be impressed as soon as they set foot in the resort. “Creating exceptional experiences by awaking emotions through evoking the senses is very important to us,” Mr. Brett Burton, Area General Manager of Banyan Tree Lang Co and Angsana Lang Co told VET. The first great experience is the comfort found in the villas. Inspired by the artistic heritage of Vietnamese dynasties past, the resort features pool villas set on the shores of Canh Duong Beach. With 64 villas, the architecture and design pay contemporary tribute to the cultural richness of the region. “Integrating clay-tiled pitched roofs, open courtyards and wooden rafter ceilings, the main building and villas feature modern interpretations of design elements seen in the traditional garden houses of Hue,” said Mr. Burton. Villa interiors also are replete with traditional Vietnamese aesthetic themes. Lotus motifs, lacquer and silk embroidery in a neutral palette of earth tones, and accents of regal purple adorn fabric, elegant furnishings, paintings and pottery. Natural materials such as bamboo, wicker, and raffia (palm) ropes are used to create a setting that blends the resort into the lush green forests surrounding it. Stepping into a 131 sq m Lagoon Pool Villa will make guests feel right at home, with natural beauty from the lagoon, natural stone steps, and well-tended private gardens. Feel rejuvenated in a Sanctuary Pool Villa, complete with a private pool, secluded timber sundeck, and a private garden overlooking the tranquil lagoon. Meanwhile, Beach Pool Villas are set in a natural environment of a beautiful garden, offering an unparalleled view of the warm, sandy beach and the sea. 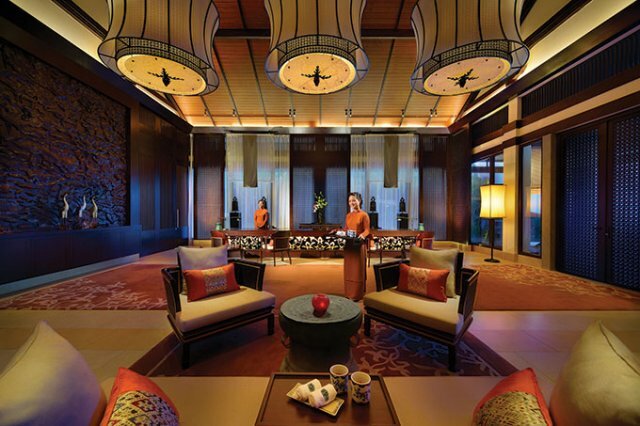 Moreover, a stay at Banyan Tree Lang Co also helps guests create exceptional experiences through their sense of taste. The wide range of dining options includes four restaurants in Banyan Tree, four others at Angsana, and the signature Destination Dining options. The Banyan Tree’s signature Saffron restaurant is not to be missed, as its crafted menu of traditional, mouth-watering Thai dishes are cooked with a modern touch and it boasts stunning sea views from its hilltop location. The resort’s second restaurant, The Water Court, a contemporary open-concept restaurant, is located below the reception area and overlooks the pool area, providing a savory menu of Vietnamese and international cuisine to satisfy every palate. Then there’s Azura, a beachfront restaurant serving Mediterranean-inspired recipes, fresh seafood, and appetizers. Finally, Thu Quan is the Banyan Tree’s authentic Vietnamese bar. Another highlight is the 18-hole golf course at Laguna Golf Lang Co, offering stunning views of central Vietnam’s natural beauty and designed by Sir Nick Faldo. 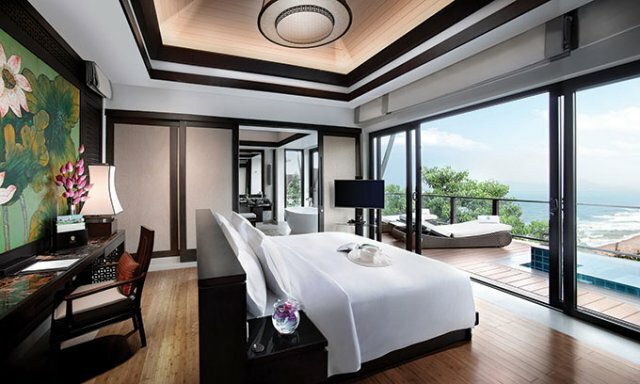 As you may expect from a Banyan Tree resort, the Meeting Room, the Laguna Water Sports Center, the Banyan Tree Gallery and the Banyan Tree Spa are also attractive. All of this leads to the uniqueness the resort possesses. “The land has an alluring natural charm that is complemented by luxury properties and services,” Mr. Burton added. Although the beauty of the resort’s grounds makes heading outside unnecessary, there is plenty to do and explore in the surrounding areas, such as entering a world of ancient and modern history, dramatic vistas in rugged landscapes, unspoiled nature, and three UNESCO World Heritage Sites: the complex of Hue Monuments, Hoi An ancient town, and My Son Sanctuary. When looking back over the last five years in Vietnam, he believes that the country’s tourism sector is still growing at an impressive rate and that Lang Co is key resort destination. “The majority of visitors are from the Asian region, so we have to bring Vietnam to the attention of travelers from all around the world,” he said.